WASHINGTON (Reuters) - More foreign students are entering U.S. graduate schools and dominating in critical fields such as computer sciences and engineering, as enrollment by Americans remains sluggish, a survey released on Thursday found. While overall first-time enrollment in graduate schools showed a slight rise of 1.8 percent between the autumn of 2011 and the autumn of 2012, after declining in the two previous years, the increase was strongly driven by a spike in enrollment by foreign students, the Survey of Graduate Enrollment and Degrees found. The annual survey is produced jointly by the Council of Graduate Schools and the Graduate Record Examinations Board. 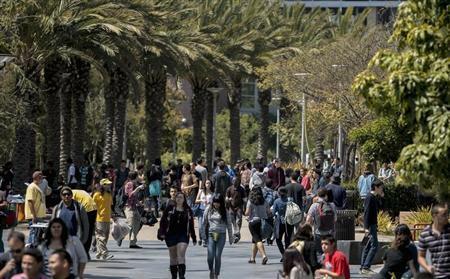 "Of particular concern here is that the decline continues to be notable in fields of compelling national need," said Debra Stewart, president of the Council of Graduate Schools. The worry is that foreign students educated in the United States will bring the technical expertise back to their home countries, and not contribute as much to U.S. economic development. Stewart said the global leadership position of the United States in research and innovation could be in jeopardy if nothing is done to encourage graduate education, which is projected to be a future driver of the U.S. economy. First-time graduate enrollment of foreign students increased by 8 percent between the fall of 2011 and fall 2012, while enrollment of American citizens and permanent residents rose by just 0.6 percent. U.S. schools attract students from all over the world, with students from China and India leading in enrollment for computer sciences and engineering graduate courses. In engineering, 50.8 percent who enrolled were international students, compared with 49.2 percent for American citizens and permanent residents. Foreign students also made up a majority in the fields of mathematics and computer sciences, accounting for 50.1 percent of graduate students in the schools surveyed. However, among U.S. citizens and permanent residents, first-time enrollment rates were up for racial and ethnic minority groups across the board. Enrollment by Hispanics was up 7.4 percent, American Indians and Alaska natives 5.7 percent and blacks or African Americans 4.6 percent. With a decline of 0.9 percent, whites were the only U.S. citizen and permanent resident group whose enrollment fell. Stewart said the sluggish overall growth in U.S. students' enrollment can partly be explained by continuous federal spending cuts to colleges and universities. That in turn pressures funding for graduate student loan subsidies, research grants and teaching assistantships. Also, as a result of the recent economic downturn, employers are spending less on funding their employees' graduate education, Stewart said. Advocates for graduate students have also recently decried a new student loan law that they say could allow interest rates for graduate student loans to spike and further discourage more Americans from pursuing graduate education.